AvPlan EFB testing against iOS 10.1 has been completed and now has the all clear. Please feel free to upgrade at your convenience. As always, we recommend you upgrading one device at a time, and refrain from upgrading if you are about to immediately depart on a trip outside internet access. Lots of SARTIME fixes in Australia. Clarified what ‘Cancel flight plan’ really means vs cancelling a SARTIME. AvPlan EFB 7.1 is now available from the Apple App Store as a free update for all users. This release delivers ground breaking capability to pilots regardless of where they fly. We have added the ability to annotate all maps, airport diagrams and instrument approach procedures. Free hand annotations can be added in any colour, transparency or pen thickness. Additionally, text based annotations can be added in a variety of fonts, sizes and colours. Once added, text annotations can be also moved around the screen for precise placement. These annotations will also seamlessly sync to all your other devices running AvPlan EFB, when signed into the AvPlan Cloud. Annotations can also be exported and imported to other peoples devices via AirDrop or email. This capability allows you to share very custom information with any user with the touch of a button. 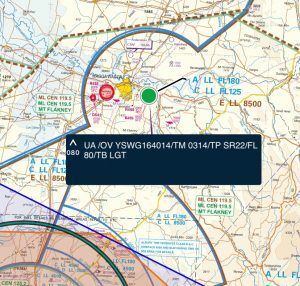 DAP pages can be annotated with NOTAM changes and shared with all other pilots within your organisation saving a huge amount of time. Local procedures can be drawn up on a map and shared with all visiting pilots to your home ALA. Tap Map Settings, Edit Map to annotate a map, or tap the Draw icon under Terminal to annotate an airport diagram or approach plate. The second major change in AvPlan EFB is the addition of pilot inflight weather reports (PIREPs). PIREPs are commonly used in the USA to communicate localised conditions, and AvPlan EFB supports that system in the USA. PIREPs that are created with AvPlan EFB are sent to NOAA and will appear in all briefing products. Elsewhere, the PIREP system is localised to AvPlan EFB. Tap on your location and select ‘Submit PIREP’ from the Nearest Items window. This is a form which allows various weather phenomenon to be added. Tap Submit and this report will be instantly shared with all other AvPlan EFB users. View PIREPs by tapping Map Settings, View Items, Pilot Reports within AvPlan EFB. PIREPs submitted by others will appear for 2 hours before they are purged from the system. 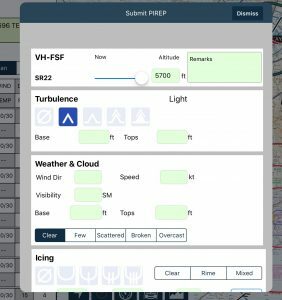 The PIREP system within AvPlan EFB is an excellent way of communicating localised weather conditions to your fellow pilots. The LSALT calculator tool has had a major renovation. It now allows RNP2 (5nm), Night VFR (10nm) or the traditional methods of LSALT calculations to be used. Additionally, you can now override a designated route LSALT with one calculated by this tool (you will be warned, but it still can be overridden). The last major change to AvPlan EFB 7.1 is the Notepad. The notepad now also allows a range of colours, pen thicknesses or transparency to be used. These notes also synchronise with all your devices in real time. AvPlan EFB 7.1 is yet another demonstration to our commitment to invest heavily in our product and make your flying safer, efficient and you a more confident pilot.